Thank you for viewing my work and taking the time to look deeper into the way I go about doing my drawing work. Each artist will have their own methods of working but, they don't all share them. It is my hope that by sharing my techniques that more people will become happier with their work and in turn will want to share what they enjoy with the people they come in contact with and promote my theme “Keep On Creating”!! 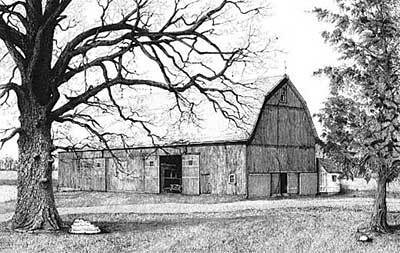 And on the large Oak tree from the Elwer barn drawing I completed in July 2005 called “Between Two Trees”. 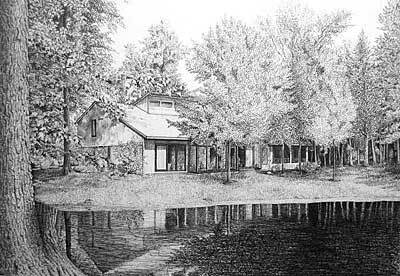 I have done many home portraits in the past. Most of those have had trees in them of one kind or another. It is something that, as an artist, no matter what level of expertise you are at, you will have to do some time. You may be asked, or just decide, to do a tree in any season of the year, so you will need to know how to apply the techniques you learn to the various conditions of each season. As you may know, I do my drawing work with Acid Free inks in ballpoint-style pens. I use Staedtler “Triplus” Fine and Medium Point pens for their archival properties. However, I have many drawings I've done in the past, with Bic or Pilot pens that are as old as 15 years and have not faded or yellowed. So, I would not be concerned with what type of ink or what brand name of pen you are using while practicing these techniques. I will only say that you should use the type of pens that you plan on doing your completed drawings with once you practice and get a handle on the techniques here. By doing this you will become more familiar with your normal tools, and will be better able to apply the techniques you learn here with them. The techniques I will go through here are ones I have developed and adapted to my needs, but I would not go so far as too say that they are the only ones that work to get the results I am looking for. As a self-taught artist, I am always looking for new ways to improve my work. But, this is what I currently do and how I do it to render trees and foliage in my drawings. Keep in mind that you may want to change a step in the process as you go. That is all a part of your “artistic license”. This is a term that refers to the ink that builds up on the ball tip of a ballpoint pen while in use. It can leave an unwanted ink spot on your paper. It happens when you use the pen in a motion that goes in more than one direction without the user lifting the ball from the surface. The ink builds up on the back side of the ball when moving it in one direction and then when you change direction the ball actually drags the ink back down and into the ball path depositing it on your surface creating an ink “blob”. To avoid this, you should clean the tip frequently. Try to get used to working your pen in one direction then lifting and returning it before placing it back down and working it in the same direction. It may sound more difficult than it is. With some practice you will get the hang of it. If in doubt, clean the tip. Better to be cleaning often than to wish you had and get the BLOB. There are two basic types of trees, Deciduous and Conifer. Deciduous trees have leaves, and Conifers have needles. Within these two basic types of trees there are many species, all of which have unique characteristics that should be considered when attempting to draw them. The best help I can be to you is to tell you that it takes a lot of time in observation of your subject in order to become familiar with the different characteristics of each type. Most of us don't wake up and just know how to draw a tree. You may say that you've seen lots of trees in your time, but have you sat for hours looking at just one? I mean get real acquainted with it. Pick a spot that you can come back to time and again for the same view. Do this at different times of the day, in different weather conditions, and in the different seasons of the year. See how the light and shadows affect your perspective of it. Make notes, do quick sketches, and photograph it.